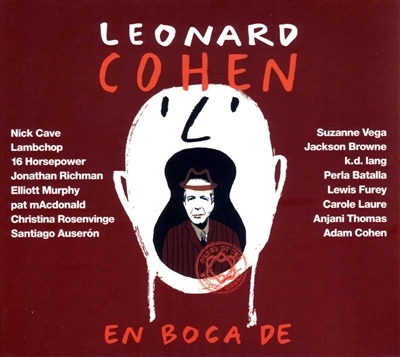 Leonard Cohen, en boca de… (Leonard Cohen by ...)(Discmedi, 2011) is a compilation album of versions that meets the most significant songs of the work of Canadian singer-poet par excellence (recently awarded with Prince of Asturias Award for Letters) - Suzanne, Bird on the Wire, The Partisan, Hallelujah, First We Take Manhattan, A Thousand Kisses Deep - selected by the biographer and translator of Leonard Cohen’s work in Spain, Alberto Manzano. Performed by a cast of musicians of international stature like Nick Cave, Suzanne Vega, kd lang, Lambchop, 16 Horsepower or the former leader of the Modern Lovers, Jonathan Richman - also includes a number of artists related to Cohen through a personal or family relationship -her son, Adam Cohen, his current girlfriend, singer Anjani Thomas, his loyal backup singer, Perla Batalla, his friend from the time of the Velvet Underground & Nico, Jackson Browne, the jazz composer Lewis Furey – that recorded in collaboration with the Canadian bard the opera-rock Night Magic (1986), in which he plays exclusively for this record a new version of the blues Fire (with lyrics belong to a poem published in the book Parasites of Heaven), or the French singer and actress Carole Laure - Lewis Furey’s wife – with a cover of Hunter´s lullaby which is rescued from the same opera-rock. Finally, the techno-pop singer pat mAcdonald - former Timbuck 3 - recorded specifically for this album an acoustic version of sublime First We Take Manhattan, while Elliott Murphy seduces us with a sweeping country version of Diamonds in the Mine. Santiago Auserón y Christina Rosenvinge - accompanied by the New York band Sonic Youth - are the Spanish contribution to this tribute, but interpreted respectively, also in English, the pieces You know who I am and Seems so long ago, Nancy, both included in the Cohen masterful album “Songs from a Room”. In short, an essential album to know the work of Leonard Cohen "in voice of" some of the most influential musicians of rock history.